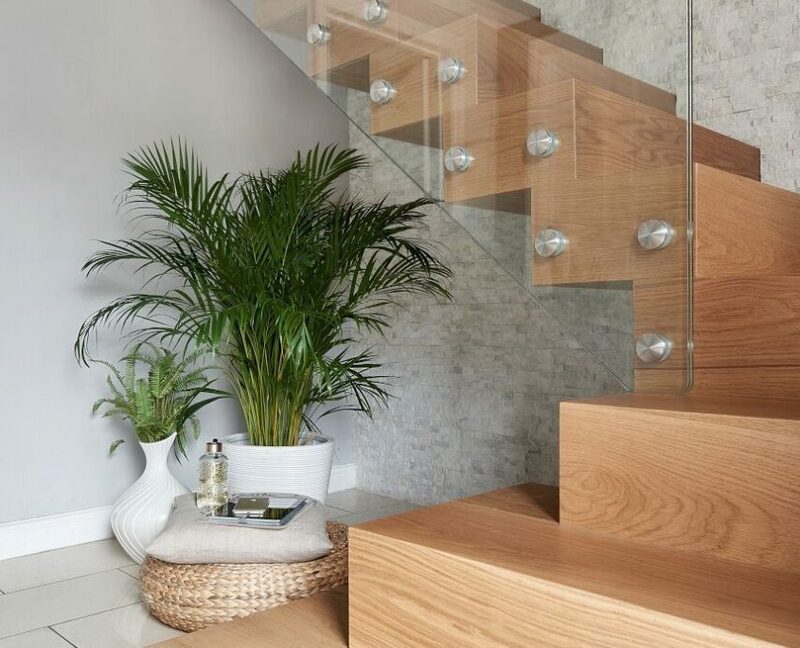 When we’re not busy creating new staircases or working on staircase renovation projects, it’s important for us to stay up-to-date with the many emerging trends in the world of interior design. Fortunately, using tools like Houzz and Pinterest helps us to keep on top of it all throughout the year. But as we move towards the end of the year, we like to engross ourselves in the predicted trends for the year ahead. 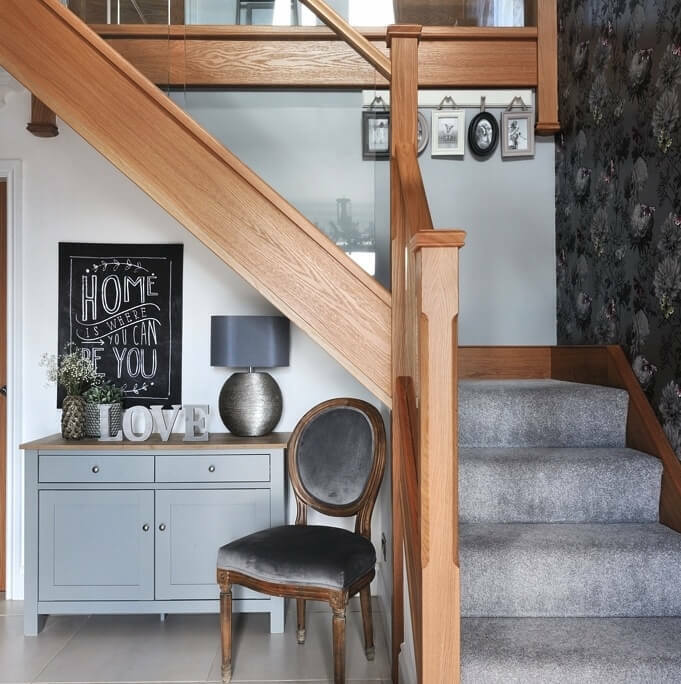 As 2017 draws to a close, we’re taking a look at the most popular choice of colours for 2018 and how these can work in your hallways whilst also complementing your staircase design. Grey is a modern alternative to neutral shades whilst being less harsh than black or monochrome themes. If styled correctly and with careful consideration, grey can create a warm and homely feel. Grey is perfectly complemented by warm oaks and modern class to create a contemporary ambience with a relatively minimalistic feel. Rich jewel colours will prove to be popular in 2018, and we couldn’t be more excited. You can make a splash with vibrant artwork or the braver amongst you could opt for a feature wall in a vivid colour. 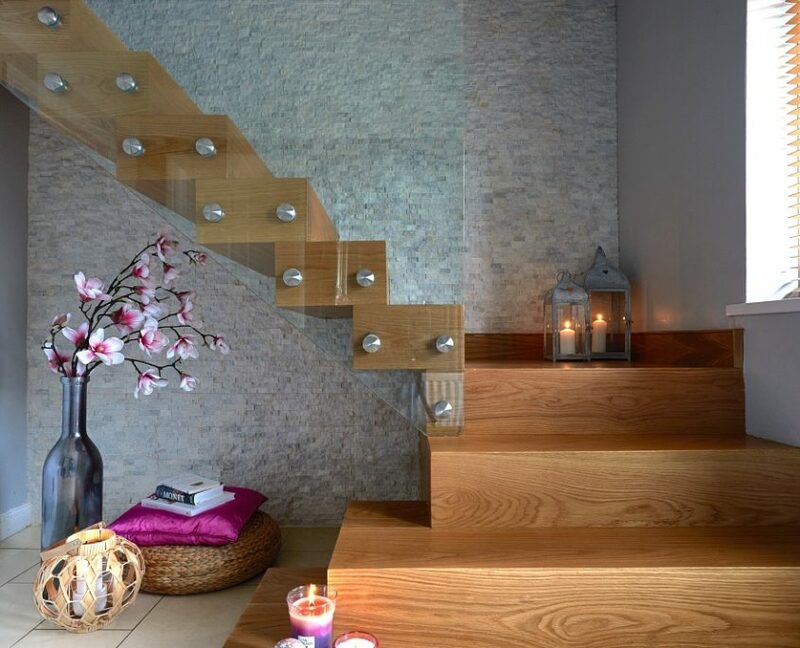 Alternatively, you can keep it subtle and add some jewel-hued accessories and let your modern staircase do the rest of the talking. The trend of bringing the outdoors in has been popular for a long time, so it’s no surprise that ‘Greenery’ was Pantone’s ‘Colour of the Year’ for 2017. It’ll continue to prove popular in 2018, and it’ll be perfectly offset by a minimalistic staircase. Fresh, vivid and invigorating, ‘Greenery’ is one of our favourite colours and it’s guaranteed to make a lasting impression in your hallways. For those of you who are unsure about if it’s the colour for you, start small by adding some feature plants into your hallway. You’ll fall in love with the fresh, contemporary feel and slowly begin adding more and more of this colour to your home. While we still feel that Greenery will be relevant next year, Pantone’s colour of the year for 2018 is actually Ultra Violet. Inventive and imaginative, it represents originality, ingenuity, and visionary thinking. The perfect colour for an exciting New Year. If you’re already starting to think about breathing a breath of fresh air into your home in 2018, get in touch with us to see how we can help.